Established in 1986, Troy is a privately held group of industrial engineering supplies businesses in the UK. Troy is the UK’s largest independent industrial buying group with over 400 member trade retail outlets in the UK, and a comprehensive online presence. Troy recently received recognition for a Top 75 fastest growing companies based on sales turnover over the last four years in South West region of the UK. Revenue has grown by ~85% since 2016. United Tooling Solutions – is an industrial supplies distributor holding 8 company trade branch outlets directly owned by the same major Troy shareholder. Toolshop Direct – operates under UTS, focused on online distribution specialising in industrial product and tooling sales with Tier 1 status ranking via the Amazon platform. 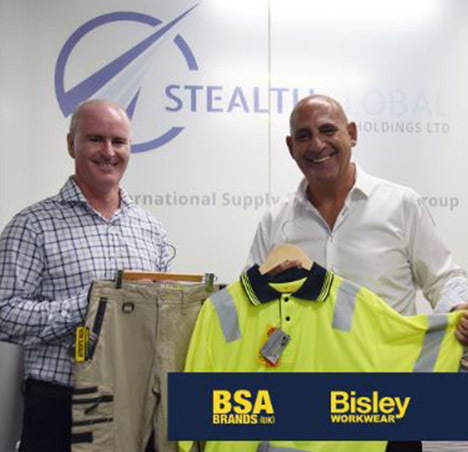 Sales and distribution of Bisley Workwear will be driven through both UTS and Troy’s trade retail outlets, and via UTS on the Amazon platform through the group’s online division Toolshop Direct. The arrangement with this group provides BSA Brands with an immediate UK national platform to introduce and grow the Bisley Workwear brand throughout the full UK market from commencement. Troy also holds 20% ownership of a major European industrial buying group with 1,500 members and over 3,300 trade outlets throughout UK and Europe with a combined trading volume of EUR16 billion – BSA Brands will seek an opportunity to further expand into Europe in the medium term through this group.